Heat oven to 350°F. In large bowl, dissolve beef bouillon in hot water. Add remaining meatloaf ingredients; mix well. Spoon mixture into ungreased 8x4-inch loaf pan or shape mixture into 8x4-inch loaf in ungreased 12x8-inch (2-quart) glass baking dish. Bake 1 1/4 hours or until beef is thoroughly cooked in center and meat thermometer reaches 160°F. Remove pan from oven. In small bowl, combine glaze ingredients. 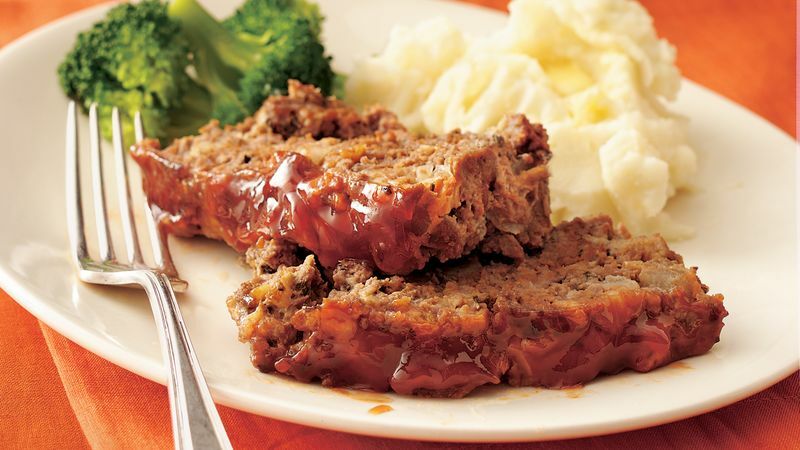 Brush top of meatloaf with glaze. Let stand, covered, 5 to 10 minutes before slicing. Serve with remaining glaze. To make this ahead, assemble the meatloaf, then cover and refrigerate it for up to one day. Uncover; bake and glaze as directed in the recipe.